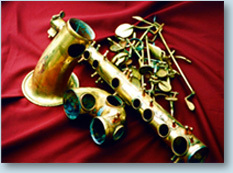 Through my technical development and my experience in teaching my craft, I have studied the organologic and technical aspects of wind instrument manufacture in the 18th and 19th centuries, particularly in the area of brass instruments. 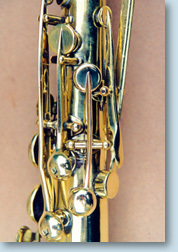 Just like a surgeon, I have had the opportunity to treat the serious injuries suffered by instruments bearing some prestigious names – Adolphe Sax, Charles Joseph Sax, Halary, Raoux, Périnet, Boehm, Lot and many others, all these masters of genius who pioneered our modern instruments as we know them. 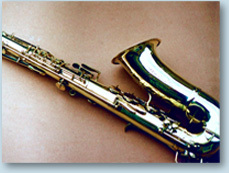 The following pictures illustrate the difficult recovery of a saxophone produced by Adolphe Sax in 1854. Sax, an inventor of genius, was the friend of Berlioz and Meyerbeer, and was an appointed supplier of His Majesty the emperor Napoleon III. 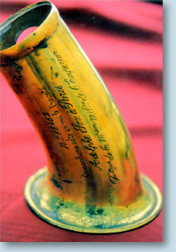 This 1830 two-valve Stoëlzel horn was found buried under the rubble of a house in Nantes. Three weeks’ work were necessary to take it apart completely, treat the metal and remove the corrosion. 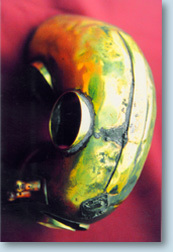 The instrument was then subjected to many heat treatments to regenerate the brass and remove the dents from the metal, which is 0.4 mm thick. The dents in the bent parts were removed with “olives” by 0.1 mm increments. After reassembling the instrument I had to restore the decoration on the bell. 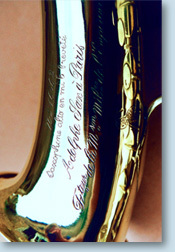 For this I reproduced the pattern carefully and hand-painted the original motif, which was barely visible.